As one of the many non resident Indians who love their Indian movies and consider them as a daily spice of their life, I have had a great year in 2013 and a privilege of watching good cinema which broke away from the formula of lost brothers, poor boy- rich girl or vice versa. Here is my list of the top picks of 2013 and while it may not include the block buster Chennai Express, it is a list that touched my sensibilities as a fan of entertaining as well as thought provoking cinema. 20. 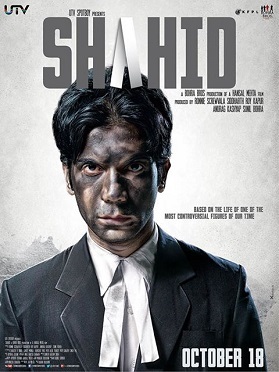 SHAHID- A movie with a cause, true story, beautifully directed by Hansal Mehta and an apt act by Rajkumar. 19. SAHEB, BIWI AUR GANGSTER RETURNS- Gripping storyline, good direction by Tigmanshu and a great act by Jimmi Shergil, Irfan Khan and Mahi. Soha fills the gaps. 18. SHUDH DESI ROMANCE- A bold story of a bold, new India. Good entertainer. Parineeti is coming of age and Vaani Kapoor is a mouth watering rasgullah. Sushant and Rishi add spice to masala. 17. AURANGZEB- Gripping story line and a powerful performance by Arjun Kapoor. Rishi is rock solid. 16. ABCD-ANY BODY CAN DANCE- Not really, especially when you see some of the dance moves. But definitely ‘Any body’ can enjoy watching those great dances with Prabhu and Ganesh at the helm. Lauren is a great dancer and creates magic on screen. The Ganpati dance is PURE MAGIC ! 15. TABLE NO. 21- What a story and what twists? Keeps you hooked till the end. A must watch. 14. JOLLY LLB- This is what cinema should be ! Great satire woven with comedy and delivered by three powerful actors of the day- Arshad Warsi, Boman Irani and Saurabh Shukla, each better than the other. The court room scenes were captivating. 13. ONCE UPON A TIME IN MUMBAI DOBAARA- I think this movie got lost in the mad rush of Chennai Express since otherwise, this movie should have been a sure shot hit. Very good performance by Sonakshi , Imran and Akhsay, good direction and engrossing story telling. 12. KRRISH 3 – A must watch not just for the super “action” sequences of the FX team but also for great performances by Hrithik, Kangana and Vivek. Definitely a return for Vivek ! As for Kangana- WOW ! 11. RAANJHANAA- Dhanush is a soft spoken powerhouse and came out with a great act. With Zeeshan Mohammad and Swara Bhaskar, they add a pathos to the act, which will be remembered for years. Rahman enchants again with great music. Makes me feel, “Naurasiya” ! And now the top 10…..
10. LOOTERA- A beautiful movie with enchanting music and amazing performances by Sonakshi and Ranveer. I think this love story is going to become one of the classics of Indian cinema. Sonakshi this is one of the best performances I have seen of a fairly new comer, EVER ! 9. VISHWAROOP- Technically sound, good story line, great acting by Kamal and Rahul and captivating cinematography. The icing on the cake was the “Kathak” piece by Kamal. 8. R RAJKUMAR- A masala entertainer. Complete Paisa Vasool. Prabhu Deva at his best. Shahid and Sonakshi were magical. Songs and dances, Wow ! “Gandi Baat” is going to become anthem music for some real good time ! Mast ! 7. BHAAG MILKHA BHAAG- A great biopic delivered in style by a great director, Rakesh O Mehra. A lot has been written about the six or eight packs which Farhan developed for this but a lot more should be written for the performance delivered by him. Some real good music. Hats off ! 6. ANKUR ARORA MURDER CASE- A thriller par excellence. This is one movie where I was as much on the side of the protagonist as that of the antagonist. This is what cinema should be made for. And K K Menon, you are just unbelievable! Your monologue in the climax, still resonates in my ears and gives me shivers! 5. KAI PO CHE- The victory roar ! And roar this movie did while delivering three tigers to the Indian cinema, Sushant, Amit and Rajkumar. Great story by Chetan Bhagat , magically directed by Abhishek Kapoor. The joyousness of youth and the brotherhood of three friends was at par with ‘Dil Chatha Hai” . Good apt music and a great end. A movie with a purpose and if India can learn anything out of this today, then the movie would have served an added purpose. 4. AASHIQUI 2 – Best music score, I have heard after Rockstar. Actually more soothing and soul searching! Shraddha Kapoor’s act was out of the world especially in the end when she talks about what lengths whe will go for her soul mate. Touching to the core ! Aditya delivered an apt performance but the movie belonged to the music and to Sharaddha. Loved it and will do. Always ! 3. INKAAR- If perfection could be depicted in movie making, story telling, acting, music, direction, editing, …, then this movie could be marked as one. CINEMA AT ITS BEST ! Sudhir Mishra, I now fully well understand why Shah Jahan asked the fingers of the people who made Taj Mahal to be cut ! You have made a masterpiece! Period ! As for Arjun Rampal, you are the GOD OF ACTING ! Watch this movie for some powerful performances, good script and for being a movie of the age, of corporate pressures , of the egos that we carry and build and above all, of understanding and the biggest four letter word- LOVE! 2. RAM LEELA- I can’t add words to what would have been written by critics /fans, et al for this movie. Sanjay L Bhansali, Deepika, Supriya, Hats off ! And Ranveer ! WOW ! You are now a SUPERSTAR! Watch out for more fireworks from this Bomb who is exploding in parts ! And the number one movie is…………..
1. DHOOM 3- What an explosion in the end of the year? Every scene, every shot, every act, creates a BANG ! The whole family watched the movies with eyes wide open and in the end, still wanted MORE! Aamir no doubt is not just an icon but perhaps is bigger than any of the Indian actors, past or present. Aamir’ presence, the story line, the action sequences, the chases, Katrina’s oomph factor, all lift the movie to a level not before seen in Indian cinema. Hats off to its cinematography and the way they have captured the skyline of CHICAGO and made it a powerful character itself. Adi, take a Bow ! 7. Best Music- Aashiqui 2- Mithoon/Jeet Ganguly/Ankit Tiwari- No competition. 8. Anthem of the year- Gandi Baat ! 9. Song of the year- Pick any from Aashiqui – all are great ! 10. Biggest surprise of the year- Chennai Express ! How did it do what it did ??? Mark my words friends ! Go watch these movies and have a ball !